The worlds’ first attention seeking car has been unveiled in Western Australia this month. No, we’re not talking about a car that desperately screams ‘look at me’ or covets your likes on Facebook. This Hyundai car has been engineered to run on driver attention. The ‘Attention Powered Car’ is part of a campaign by Western Australia’s RAC to better understand the dangers of driver distraction – but you won’t be able to buy the new car any time soon. RAC teamed up with Emotiv to engineer computer software to be implemented in a Hyundai i40. The technology works through operant conditioning – that is, the system punishes the driver for not paying attention by removing driving privileges. Here’s how it worked: the car’s driver wore a headset equipped with 14 sensors that detect electrical activity from various areas of the brain. Whenever the device detected brain activity conducive to inattention (when the driver was texting, drinking water, changing the radio etc. ), the computer software would “punish the driver by either de-activating the throttle, causing the vehicle to slow or stop, or implementing a speed limit of 15km/h”. Watch the technology in action below. It’s no secret that driver inattention is a big problem in WA – more than half of deaths in WA occurring on country roads, according to RAC WA General Manager Pat Walker. “The impact of inattention is now comparable to the number of deaths and serious injuries caused by speed and drink driving which are all contributors to WA consistently having the worst fatality rate of any Australian state,” Mr Walker warns. 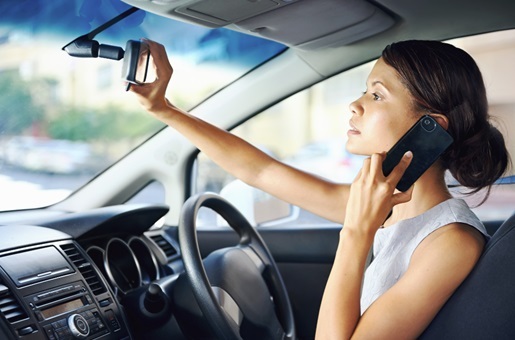 “Nationally, it is estimated inattention was a factor in 46 percent of fatal crashes”. Last month we got down to the nuts and bolts of driver distraction and inattention at the wheel, pointing to visual (what you’re looking at), manual (what you’re touching) and cognitive (what you’re thinking) attention types. It’s important to keep all three on driving when you’re behind the wheel – at least until cars start really demanding our attention. Would you drive an attention-powered car?